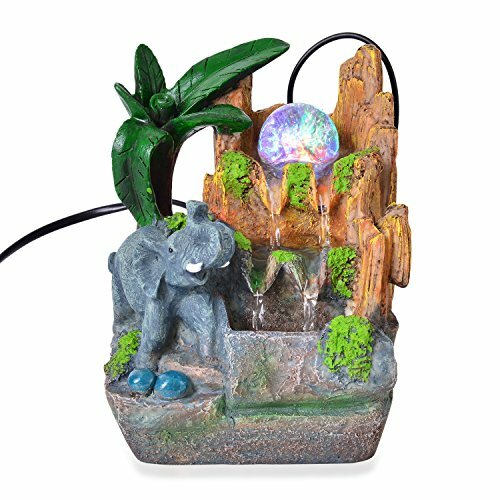 Shop LC Multi Color Glass LED Light Elephant's Waterfall Fountain Home 4.5x4x7.5'' | Fountain City Art Ctr. Shop LC Multi Color Glass LED Light Elephant's Waterfall Fountain Home 4.5x4x7.5'' by Shop LC at Fountain City Art Ctr.. MPN: 2966312. Hurry! Limited time offer. Offer valid only while supplies last. Give a soothing appeal to your home or office interior with this gray and yellow glass LED water fountain from the Home Décor Collection. Give a soothing appeal to your home or office interior with this gray and yellow glass LED water fountain from the Home Décor Collection. Beautifully handcrafted and attached with LED lights, it is an ideal piece to add a comforting appeal to the environment, as the sound of water flow will make everyone feel relaxed. If you have any questions about this product by Shop LC, contact us by completing and submitting the form below. If you are looking for a specif part number, please include it with your message.